Wawayanda State Park is a 34,350 acres (139.0 km2) state park in Sussex County and Passaic County in northern New Jersey. 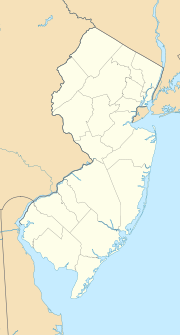 The park is in Vernon Township on the Sussex side, and West Milford on the Passaic side. There are 60 miles (97 km) of hiking trails in the park, including a 20 miles (32 km) stretch of the Appalachian Trail. The park is operated and maintained by the New Jersey Division of Parks and Forestry. The hiking trails are maintained and updated by the New York - New Jersey Trail Conference. The park is part of the Northeastern coastal forests ecoregion. It is home to the red-shouldered hawk, the barred owl and the great blue heron, and includes 1,300-foot (396 m) Wawayanda Mountain and glacially-formed, spring-fed Wawayanda Lake with a swimming beach and boat launch and group camping. The 1,325 acres (5.36 km2) Bearfort Mountain Natural Area is a part of the park, with Terrace Pond at 1,380 feet (420 m) near the top. The mountain forest includes swamp hardwood, hemlock and mixed hardwood and chestnut oak forest communities; some rock outcrops have a 360-degree view of the surrounding highlands. 2,167 acres (8.77 km2) Wawayanda Swamp Natural Area is an Atlantic white cedar swamp with a mixed oak-hardwood forest and a lake and Laurel Pond. 399 acres (1.61 km2) Wawayanda Hemlock Ravine Natural Area is a 300 feet (91 m) ravine formed by Doublekill Creek surrounded by a hemlock and mixed hardwood forest. The Appalachian Trail is located on the western edge of the area. Wikimedia Commons has media related to Wawayanda State Park. This page was last edited on 6 May 2018, at 15:06 (UTC).